I often give talks at conferences and meetings around the world. This page is always incomplete and usually out of date but offers an idea of the types of things I often talk about. I am always interested in speaking to new audiences. Please don't hesitate to get in contact with me if you are interested in having me talk at a conference. Although all of my conference papers (both archival and non-archival) were also presented, I have not include them again here. [Lecture and Discussion] “Democratizing Data Science.” University of Washington Alumni Hall of Fame Reception, University of Washington, Seattle, Washington, February 28, 2018. [Discussion Facilitation] “Will Wikipedia exist in 20 years?” With Katherine Maher. Berkman Klein Center for Internet and Society, Harvard University, Cambridge, Massachusetts, October 17, 2017. [Paper Presentation] “Democratizing Data Science: Perspectives from the Community Data Science Workshop and Software Carpentry.” With Dharma Dailey	and Jonathan T. Morgan. Data Science Studies Group, eScience Institute, University of Washington, Seattle, Washington, March 6, 2017. [Paper Presentation] “Critical Data Literacies.” With Sayamindu Dasgupta. Data Science Studies Group, eScience Institute, University of Washington, Seattle, Washington, February 8, 2017. [Paper Presentation] “The Hidden Costs of Requiring Account Creation: Evidence from Peer Production.” Colloquium, Department of Communication, University of Washington, Seattle, Washington, November 30, 2016. [Paper Presentation] “The Hidden Costs of Requiring Account Creation: Evidence from Peer Production.” With Aaron Shaw. Workshop and Lecture Series on the Law & Economics of Innovation, ETH Zurich, Center for Law & Economics, Department of Humanities, Social and Political Science, November 15, 2016. [Paper Presentation] “The Wikipedia Adventure: Field Evaluation of an Interactive Tutorial for New Users.” With Aaron Shaw. Workshop and Lecture Series on the Law & Economics of Innovation, ETH Zurich, Center for Law & Economics, Department of Humanities, Social and Political Science, November 14, 2016. [Workshop] “Scratch Community Blocks Workshop.” With Sayamindu Dasgupta. Scratch Conference, MIT Media Lab, Cambridge, Massachusetts, August 5, 2016. [Lecture] “Charting Pathways to Community Success.” Big Social Data Day, eScience Institute, University of Washington, Seattle, Washington, May 31, 2016. [Lecture] “Using High Performance Computing for Social Computing Research.” University of Washington HPC Club, Data Science Studio, University of Washington, Seattle, Washington, May 12, 2016. [Paper Presentation] “The Hidden Costs of Requiring Account Creation: Evidence from Peer Production.” Voice, Technology & Impact Workshop, Department of Communication, University of Washington, Seattle, May 6, 2016. [Paper Presentation] “`Accounting' for Transaction Costs in Online Collective Action.” Wikia Inc., San Francisco, California, October 18, 2015. [Paper Presentation] “`Accounting' for Transaction Costs in Online Collective Action.” Wikimania 2015. Mexico City, Mexico, July 18, 2015. [Lecture and Discussion Facilitation] “Missing Voices on Wikipedia.” With Monika Sengul-Jones. Center on Communication, Difference, and Equity, University of Washington, April 22, 2015. [Lecture] “Volunteer Mobilization in Peer Production.” Department of Computer Science, University of California Santa Barbara, April 16, 2015. [Lecture] “Volunteer Mobilization in Peer Production.” University of Milan, Milan, Italy, March 28, 2015. [Lecture and Q&A] Discussion of The Internet’s Own Boy. Workshop on Privacy, Surveillance, and Activism, Erasmus Research Centre for Media, Communication and Culture, Erasmus University, Rotterdam, The Netherlands, March 24, 2015. [Paper Presentation] “Access Without Empowerment.” Workshop on Privacy, Surveillance, and Activism. Erasmus Research Centre for Media, Communication and Culture, Erasmus University, Rotterdam, The Netherlands, March 24, 2015. [Panel] Discussion of The Internet's Own Boy. Information & Society Center, Information School, University of Washington, November 24, 2014. [Lecture] “Understanding Collaborative Creativity in Scratch.” Center for Data Science, University of Washington, Tacoma, November 19, 2014. [Lecture, Q&A, Event Organization] “Introduction to Free Software.” Open Source Comes to Campus. University of Washington. November 16, 2014. [Lecture] “Creativity Without Law in Remixing.” Creativity Without Law Conference, Case Western University School of Law, November 7, 2014. [Paper Presentation] “Access Without Empowerment.” Wikimania 2014, London, UK. August 9, 2014. [Invited Expert Participant] Data and Digital Methods BarCamp, ENSCI & Medialab, Science Po, Paris, France, June 27, 2014. [Lecture] “Volunteer Mobilization in Peer Production.” Medialab, Sciences Po, Paris, France. June 25, 2014. [Lecture and Workshop Facilitation] “Remixing Research and Scratch Data.” With Andrés Monroy-Hernández. Scratch Data Summit, MIT Media Lab, Cambridge, Massachusetts, March 21, 2014. [Lecture] “Volunteer Mobilization in Peer Production.” DUB Seminar, University of Washington, January 8, 2014. [Paper Presentation] “Laboratories of Oligarchy? How the Iron Law Extends to Peer Production.” ZEW/KMRC Workshop: User behavior and content generation on Wikipedia, ZEW, Mannheim, Germany, November 9, 2013. [Paper Presentation] “Laboratories of Oligarchy? How the Iron Law Extends to Peer Production.” MIT Economic Sociology Working Group, MIT, Cambridge, Massachusetts, May 8, 2013. [Paper Presentation] “Laboratories of Oligarchy? How the Iron Law Extends to Peer Production.” Harvard Cooperation Group, Berkman Center for Internet and Society, Harvard, Cambridge, Massachusetts, April 16, 2013. [Paper Presentation] “Laboratories of Oligarchy? How the Iron Law Extends to Peer Production.” Center for Information Technology Policy, Princeton, April 11, 2013. [Lecture] “Failures of Collective Action.” Cognitive Science Colloquium, School of Cognitive Science, Hampshire College, April 10, 2013. [Lecture] “Failures of Collective Action.” Department of Communication, University of Washington, October 26, 2012. [Lecture] “Failures of Collective Action.” The Future of Security: Ethical Hacking, Big Data, and the Crowd, Parsons Institute for Information Mapping, The New School, New York, New York, October 24, 2012. [Paper Presentation] “Almost Wikipedia: What Eight Early Online Collaborative Encyclopedia Projects Reveal About the Mechanisms Of Collective Action.” Microsoft Research, Cambridge, Massachusetts, August 13, 2012. [Keynote Lecture] “When Peer Production Works: Learning from Failures to Improve Collaboration.” Wikipedia Academy 2012, Freie Universität, Berlin, June 29, 2012. [Paper Presentation] “Is Volunteer Labor a Fixed and Finite Resource? Evidence from Peer Production.” With Aaron Shaw. MIT Economic Sociology Working Group, MIT, Cambridge, Massachusetts, April 24, 2012. [Paper Presentation] “Almost Wikipedia: What Eight Early Online Collaborative Encyclopedia Projects Reveal About the Mechanisms Of Collective Action.” Conference on Digital Commons, Barcelona, Spain, December 29, 2011. [Paper Presentation] “Almost Wikipedia: What Eight Early Online Collaborative Encyclopedia Projects Reveal About the Mechanisms Of Collective Action.” MIT Economic Sociology Working Group, MIT, Cambridge, Massachusetts, November 17, 2010. [Paper Presentation] “Status, Social Signaling and Collective Action in a Peer Production Community.” With Aaron Shaw. Laboratory for Social Research Seminar, UC Berkeley, Berkeley, California, October 28, 2011. [Paper Presentation] “Almost Wikipedia: What Eight Early Online Collaborative Encyclopedia Projects Reveal About the Mechanisms Of Collective Action.” MIT Center for Collective Intelligence, MIT, Cambridge, Massachusetts, May 20, 2011. [Paper Presentation] “Status, Social Signaling and Collective Action in a Peer Production Community.” MIT Economic Sociology Working Group, MIT, Cambridge, Massachusetts, May 18, 2011. [Paper Presentation] “Almost Wikipedia: What Eight Early Online Collaborative Encyclopedia Projects Reveal About the Mechanisms Of Collective Action.” Technological Innovation, Entrepreneurship, and Strategy Seminar, MIT Sloan, Cambridge, Massachusetts, November 22, 2010. [Lecture] “Wikipedia as a Platform.” MIT Innovation Lab, Cambridge, Massachusetts, November 4, 2010. [Lecture] “Free/Libre Open Source Software 101.” Knight Foundation News Conference, MIT, Cambridge, Massachusetts, June 16, 2009. [Paper Presentation] “Causal Effects of a Reputation-Based Incentive in a Peer Production Community.” MIT Economic Sociology Working Group, MIT, Cambridge, Massachusetts, June 9, 2010. [Paper Presentation] “Causal Effects of a Reputation-Based Incentive in a Peer Production Community.” Harvard Cooperation Group, Berkman Center for Internet and Society, Harvard, Cambridge, Massachusetts, April 26, 2010. [Lecture] “The State of FLOSS Research.” Department of Computer Science, University of Massachusetts, Amherst, Massachusetts, November 20, 2009. [Paper Presentation] “Revealing Errors.” Internet and Society Project, Yale Law School, New Haven, Connecticut, March 24, 2009. [Paper Presentation] “Revealing Errors.” Harvard-MIT-Yale Cyberscholar Working Group, Harvard, Cambridge, Massachusetts, October 21, 2008. [Lecture] “Voting Machinery for the Masses.” Future of Civic Media Conference, MIT Center for Future Civic Media, MIT, Cambridge, Massachusetts, June 13, 2008. Following artist Mark Tribe I have a short talk introducing free software and its role in emergencies and disaster situations that focused on the wonderful Sahana project. This first half of this talk introduced the One Laptop per Child Project and the XO-1 laptop. In this introduction, I focused on the published principles and stated goals of the project and tried to draw connections between the software and hardware design and development model and these goals. In the second half of the talk, I focused on the reasons behind OLPC's stated commitment to free and open source software and argued for free software in Constructionist education projects and in education and development work more generally. This talk built on personal experience and work with the One Laptop per Child program to make a strong case for the use of free and open source software in education. [Panel] “Clouding Computing and Free and Open Source Software.” Computing in the Cloud Workshop, Center for Information Technology Policy, Princeton University, Princeton, New Jersey, January 22, 2008. [Lecture] “Reflections on Decoding Liberation.” Book Launch for Decoding Liberation, Brooklyn College, November 15, 2007. [Lecture] “Parallel Document Development.” Open and User Innovation Conference, Copenhagen Business School, June 27, 2007. Most people have used Wikipedia and understand that it is contributed by many people. In fact, each Wikipedia is the product of a long and complicated process. This talk walks to the process that led to the creation of a large article and some of the policies, peoples, tools, and venues that lie hidden below the surface of many Wikipedia articles. [Lecture] “Reflections on the War on Share.” With Elizabeth Stark. Media in Transition 5, MIT, Cambridge, Massachusetts, April 27, 2007. MIT's Center for Advanced Visual Studies held a gathering with nine short talks under the title Come Together on social change, social responsibility, technology, and activism. 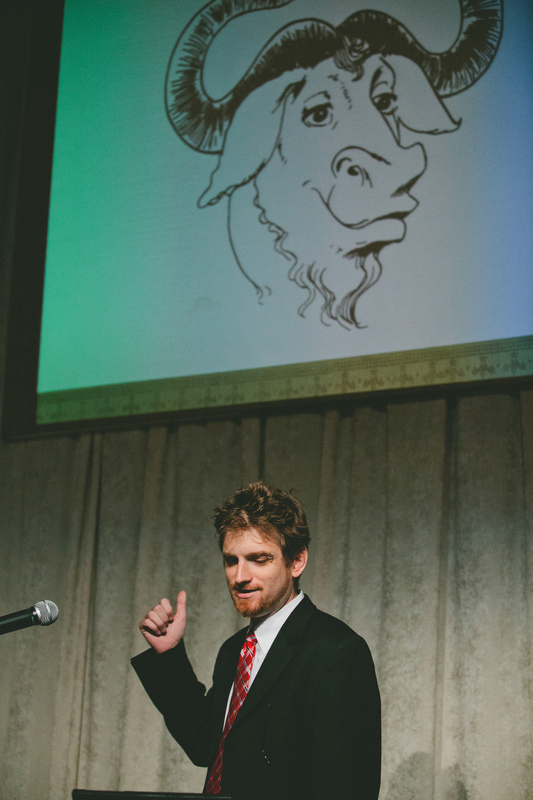 I was honored to give one of these talks; the final talk was given by Noam Chomsky. In my talk, I tried to give an overview of the world of social movements and projects trying to protect "information freedom." I have only a very rough set of notes. This talk briefly introduces Debian and gives a brief overview of its organizational model. It argues that Debian has succeeded because it's employed a more participatory/democratic model for decision making than most propriety software products and more than many other Free Software projects. It presents Debian as a compelling model for the production of better software in a better way. As part of the event, Modelli Liberi Come L'Aira (Free Models: Like the Air), I presented a piece on the role that control plays in the production of collaborative literature. The talk was heavily based heavily off some of the other talks I've given as part of my collaborative literature project. This section includes invitation or application-only workshops. When I give a lecture or present a paper, I will not list it again here. Social Science FOO Camp. Organized by O'Reilly, SAGE, and Facebook. Facebook Campus, Palo Alto, California. February 2-3, 2018. The Science of Counter-Earth: Multiply Instantiated Institutions. The Neukom Institute for Computational Science at Dartmouth. Hosted at Pierce's Inn, Etna, New Hampshire. May 12-15, 2017. Workshop on Developing a Research Agenda for Human-Centered Data Science. Conference on Computer-Supported Cooperative Work and Social Computing (CSCW 2016), San Francisco, California, February 28, 2016. Workshop on Breaking into New Data-Spaces: Infrastructure for Open Community Science. Conference on Computer-Supported Cooperative Work and Social Computing (CSCW 2016), San Francisco, California, February 27, 2016. Workshop on Access To Knowledge (A2K). Open Society Initiative. Stoke, United Kingdom, August 5-6, 2015. Microsoft Research Faculty Summit. Microsoft, Redmond, Washington, July 8-9, 2015. Workshop on Advancing an Industry/Academic Partnership Model for Open Collaboration Research. Conference on Computer-Supported Cooperative Work and Social Computing (CSCW 2014), March 14, 2014. Social Computing Symposium. Microsoft FUSE Labs, San Francisco, California, January 11-13, 2015. Digital Youth Think Tank. University of Washington Information School, October 16-17, 2014. Data and Digital Methods BarCamp. ENSCI & Medialab, Science Po, Paris, France , June 27, 2014. Social Computing Symposium. 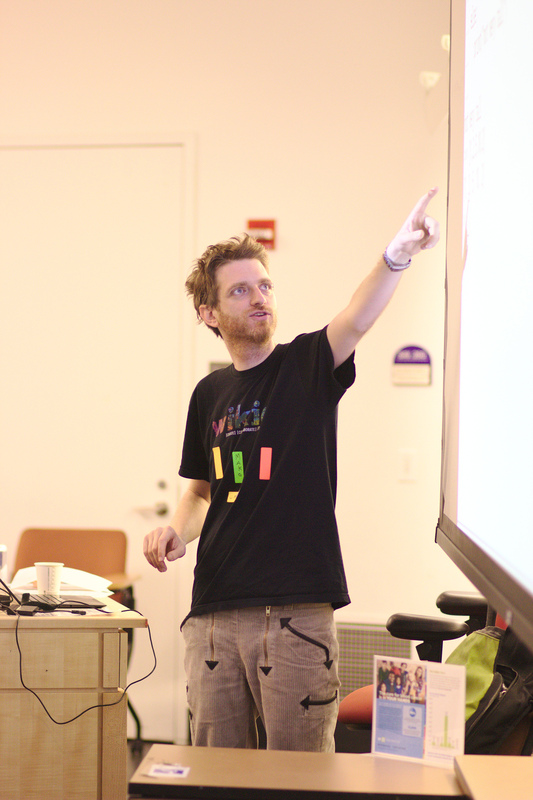 Microsoft FUSE Labs, New York, New York, January 15-17, 2014. Crowdcamp Workshop. Conference on Computer-Supported Cooperative Work and Social Computing (CSCW 2013), San Antonio, Texas, February 23-24, 2013. [Keynote Lecture] “Whither Peer Production: Free software and the shifting landscape of online cooperation.” LibrePlanet 2018, Cambridge, Massachusetts, March 25, 2018. [Panel] “Software Freedom Challenges Ahead.” Swatantra '17, Trivandrum, Kerala, India, December 21, 2017. [Lecture] “Access Without Empowerment.” Swatantra '17, Trivandrum, Kerala, India, December 21, 2017. [Keynote Lecture] “User Innovation Communities.” Industrial Research Institute Annual Meeting. Seattle, Washington, April 27, 2015. [Lecture] “When Free Software Isn't Better.” SeaGL, Seattle, Washington, October 25, 2014. [Lecture] “Revealing Errors.” Technology Activism 3rd Monday, Seattle, Washington, September 15, 2014. 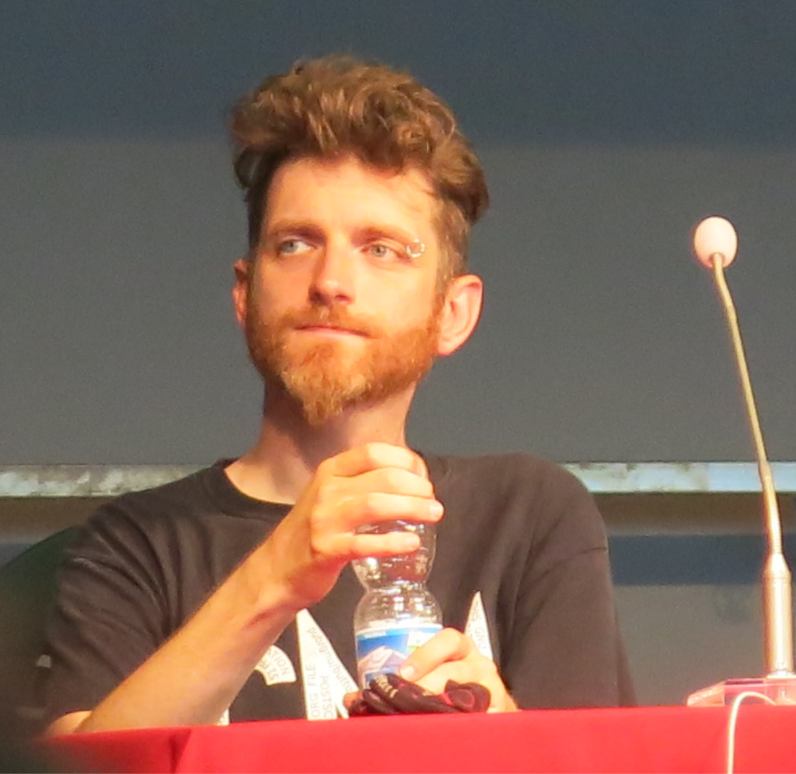 [Lecture] “Informed But Unempowered: Why Our Movement Only Fulfills Half Its Mission.” Wikimania 2014, London, UK, August 9, 2014. [Lecture] “When Peer Production Succeeds.” Free Software User Group, Cambridge, Massachusetts, May 1, 2013. [Keynote] “From Free Software to Free Culture.” Students for Free Culture Meeting (FCX2013), New York Law School, New York, New York, April 20, 2013. [Lecture] “When Free Software Isn't Better.” LibrePlanet, Harvard University, Cambridge, Massachusetts, March 23, 2013. [Lecture] “From Free Software to Free Culture.” Creative Commons All Staff Meeting, Mountain View, California, February 6, 2013. 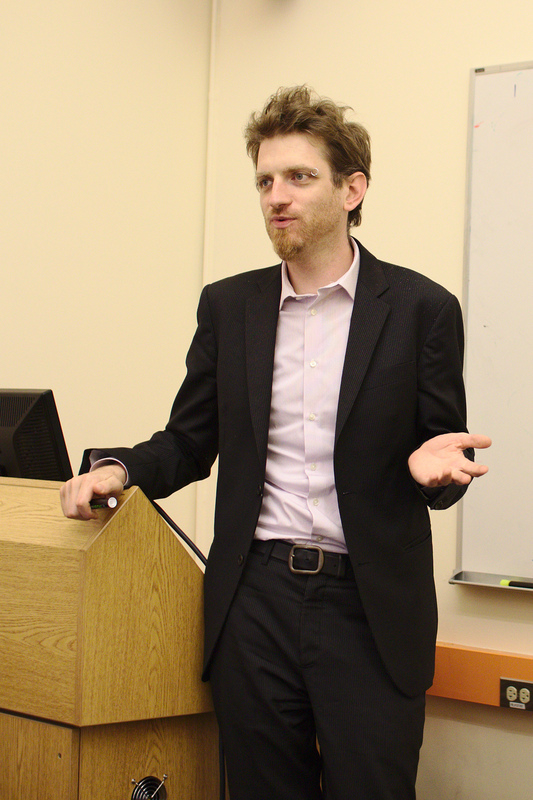 [Lecture] “Designing for Cooperation with Social Incentives.” WikiHow, Palo Alto, California, September 14, 2012. [Lecture] “When Wikis Work: Learning from Failures to Build Online Communities.” Wikia Inc, San Francisco, California, September 13, 2012. [Lecture] “From Free Software to Free Culture.” Wikimedia Foundation All Staff Meeting, San Francisco, California, September 13, 2012. [Lecture] “Almost Wikipedia: A What Eight Collaborative Encyclopedia Projects Reveal About Mechanisms of Collective Action.” Wikimania 2012, George Washington University, Washington, DC, July 13, 2012. [Lecture] “The State of Wikimedia Scholarship (2011-2012).” With Jodi Schneider Wikimania 2012, George Washington University, Washington, DC, July 12, 2012. [Lecture] “Can Social Awards Create Better Wikis?” With Aaron Shaw Wikimania 2012, George Washington University, Washington, DC, July 12, 2012. [Keynote Lecture] “When Peer Production Works: Learning from Failures to Improve Peer Production.” Wikipedia Academy, Berlin, Germany, July 30, 2012. [Lecture & Workshop] “How To Release Your Project as Free Software.” Festival of Learning, MIT Media Lab, Cambridge, Massachusetts, January 27, 2012. [Panel] “Wikipedia Research.” The Open Knowledge Conference, Berlin, Germany, July 1, 2011. Long talk roughly based on my 2010 essay of the same title. A talk given to a middle school and high school trying to interest students in becoming Wikipedia editors and giving them pointers to resources that would allow them to do so. [Online Lecture] “Antifeatures.” Free Technology Academy, February 10, 2011. [Lecture] “Antifeatures.” FrOSCon, Sankt Augustin, Germany, August 22, 2010. [Lightning Talk] “Lightning Photography with Free Software.” Debconf, Columbia University, New York, New York, August 7, 2010. [Lecture] “Antifeatures.” Debconf, Columbia University, New York, New York, August 5, 2010. [Panel] “Free Network Services.” The Free Software Foundation's Libre Planet, Harvard University, Cambridge, Massachusetts, March 21, 2010. [Lecture] “Antifeatures.” Students for Free Culture Conference, George Washington University, Washington DC, February 14, 2010. [Lecture] “Antifeatures.” Hampshire College, Amherst, Massachusetts, November 20, 2009. [Lecture] “Free Network Services.” The Free Software Foundation's Libre Planet, Harvard University, Cambridge, Massachusetts, March 21, 2009. [Lecture] “Revealing Errors.” Razmajena Vjestina, MAMA, Zagreb, Croatia., January 6, 2009. [Lecture and Demo] “Voting Machinery for the Masses.” IEEE Boston Section, Society on Social Implications of Technology, MIT Lincoln Labs, Lexington, Massachusetts, October 20, 2008. This talk, delivered with John Sullivan, discussed and shows free software on a variety of mobile devices. This included CHDK, RockBox, and OpenMoko. [Lightning Talk] “Advocating Software Freedom by Revealing Errors.” O'Reilly Ignite Boston 4, Boston, Massachusetts, September 11, 2008. This talk that explores my thinking about and work on Selectricity and on related free and open source voting work aimed at groups other than governments. A short talk (15 minutes) that built on my work on Revealing Errors and summarized my thinking in regards to that project to date. [Panel] “Creative Commons.” Wikimania 2008, Bibliotecha Alexandrina, Alexandria, Egypt, July 19, 2008. I filled in for a friend who could not make the conference and gave a short demonstration of and introduction to Zotero focused on Wikipedians. This talk presented the arguments in my Revealing Errors article published in Media/Culture and some of the work and examples that I've been posting on the Revealing Errors blog. [Lightning Talk] “Voting Machinery for the Masses.” O'Reilly's Ignite Boston 3, Cambridge, Massachusetts, May 29, 2008. [Lecture] “Advancing a Definition of Free Culture.” Sun's Community One, Moscone Center, San Francisco, California, May 5, 2008. An updated version of the talk I gave at the FSF Members Meeting. I discussed issues related to free software and network services and introduced upcoming meeting on the topic to be held the next day at the FSF. This largely autobiographical talk that built heavily off my Story of Unlearning. This talk revisited (and was closely based on) my To Fork or Not To Fork lecture given several times in 2005. In addition to several lengthy media interviews, I gave a redux of the panel and talk given at CK13 at the television station. I worked with my friends from mi2 in Zagreb, Croatia to give a talk on a panel discussing hacker culture and geared toward a general audience. The panel was framed by the System.hack() — an exhibition that mi2 was traveling with and presenting throughout the Balkans and which I helped write material for. On the panel, I talked about why hacking (both the transgressive and wholly constructive forms) is essential to society and to non-hackers. [Lecture and Workshop] “Debian Packaging for System Administrators.” SIPB Clue Dump, MIT, Cambridge, Massachusetts, November 12, 2007. [Lecture] “Free Software and Radical Non-Discrimination.” Software Freedom Day 2007, Boston, Massachusetts, September 15, 2007. An early presentation of my MIT Media Lab thesis work on a wiki for collaborative authorship of branched articles. A reprise of the free culture speech I had been giving frequently over the summer. I organized and moderated a round table discussion on issues and problems related to derivative distributions. The discuss involved representatives of all of the major derivative distributions present at Debconf. This talk offers a "Debian Themed" quick tour through the academic, legal, and business worlds. It overs insight into what everyone outside of Debian is saying about, doing with, and learning from the Debian project. In doing so, it hopes to give Debian participants some insight into fields and areas that they are largely unfamiliar with (e.g., management, sociology, anthropology, economics, computer supported collaborative work, etc.). It illuminates what others — especially academics — find useful or inspiring about the project and to facilitate self-reflection and self-improvement within Debian. It reflects on the impact that Debian has had in the world beyond the Debian project and, in particular, in those areas that many Debian developers may not be familiar with. Another version of the free culture stump speech. It was given as part of a panel on philosophy of free culture and the commons. A shorter version of my Toward a Standard of Freedom and Definition of Free Cultural Works talk. This talk was another version of my call for free software building off of Toward a Standard of Freedom and Definition of Free Cultural Works. 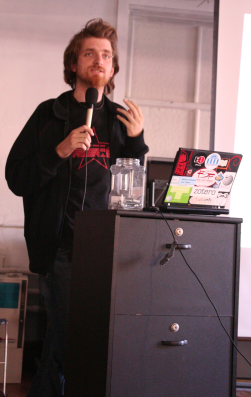 The talk was tailored toward FSF members and more closely drawing analogies between the free software and free culture movements. I introduced people to the various ways that they might contribute to Ubuntu by walking through the large wiki page on the subject in the Ubuntu wiki. In the afternoon, I ran a workshop on packaging essentials where I walked participants through the creation of a Debian/Ubuntu package. Focusing on the argument made in Toward a Standard of Freedom, I discussed the and debated the issues at stake with Creative Common's Lawrence Lessig. I delivered a short prepared talk and then discussed the issues with Lessig and the crowd. This talk aimed to introduce the argument made in Toward a Standard of Freedom about Creative Commons and the free software movement and to argue for the adoption of the Definition of Free Cultural Works. Aimed a non-technical audience, this talk begins by introducing intellectual property and tries to describe the history of the current problems created by modern IP policy. It continues by offering a rough classification of the types of "solutions" being offered and then goes into some depth on the Free/Open Source Software model. I discuss the reasons Free Software has succeeded and try to describe some of the benefits and limitations of applying its model to the production of other types of creative works. At the monthly meeting of the famous Boston-based Boston Linux Unix, I gave an Ubuntu talk that pulled from both my introductory Ubuntu talks and the To Fork or Not to Fork . It was a two hour talk to a very mixed audience. I gave another version of the talk I gave at LinuxTag and Libre Software Meeting on Ubuntu, Debian, and derivation. See the notes and slides below which were nearly identical again. I gave a version of the talk I gave at LinuxTag several weeks before on the process of building Ubuntu. See the notes and slides below which were nearly identical. The Libre Software Meeting organizers asked me to return to LSM again in 2005 and give a talk that went into depth on a topic I touched on at LSM in 2003 in Lessons from Libre Software Political and Ethical Practice . This talk describes one way of understanding the concept of freedom and its importance in free software without falling into reductionist analyses. It pulled heavily from the essay How Free Became Open and Everything Else Under the Sun which I published with Biella Coleman last year. This talk is based on my essay of the same title and is aimed at technically oriented free software developers. It describes the Ubuntu development process and some of the lessons that have been learned while building the distribution as a derivation of Debian. It tries to be an Ubuntu talk that is more technical than the standard "introduction to Ubuntu" and that is also not limited in appeal to only current or prospective Ubuntu developers. Since I gave this talk several times, the slides and notes here are the version from the third presentation. This talk is based off of my paper on Problems and Strategies in Financing Voluntary Free Software Projects. I wrote and presented the paper for Linuxtag 2005. These slides and notes are quite heavily on the pre-paper version of the talk I gave at FISL 5 in Porto Alegre, Brazil a bit more than a year ago. Ubuntu Down Under (UDU) was a one-week developer conference to plan Ubuntu's Breezy Badger release. I coordinated the community track: one of four major themed tracks at the conference. I also ran or helped run more than two dozen sessions — mostly on community related issues. The sessions were small, usually comprising only a few people, and ended with the creation of a specification to work toward completing in the next six months. As part of the Debian mini-conf at Linux Conference Australia 2005, I delivered a talk on CDDs and the process of customizing Debian more generally. It was heavily based off talks I'd given in the past. I met with the Northern New Jersey Linux Meet-up to hand some Ubuntu CDs to show people a few things about making Debian/Ubuntu packages, and to answer any questions that people had. I gave a version of the talk I gave in Manizales on Ubuntu and the process of customization Debian that has gotten it to where it is today. The talk was given to the the Southern Connecticut Open Source User Group. I did not prepare additional slides or notes for this talk (simply recycling the notes from my Manizales talk. This talk centered on Ubuntu and its relationship to Debian and the process of derivation and the difficult process of balancing forking and collaboration. This talk ended up being more of an introduction to Ubuntu and to Debian and Debian derivation and I didn't really get to dig my teeth into the key issues that the title might imply to the degree that I'd hoped. The talk was mostly a combination of my talks Customizing Debian given at NYLUG and BaDoPi and Introducing Ubuntu given at GULEV. The talk was given in English with simultaneous translation into Spanish. While visiting Mataró during the Ubuntu Conference I was invited to give a talk in Barcelona at the Grupo de usuarios de Software Libre de Barcelona, more commonly known as Badopi. This talk was a short (45 minutes) version of the "Customizing Debian" I gave the NYLUG user group and uses slides derived from that talk. The talk was given in English (without translation). This talk is a two hour introduction to Ubuntu — the concept, history, current status and future. The talk was an invited keynote presentation at the Congreso GULEV. Other keynotes were given by Randall Schwartz, Jon "Maddog" Hall, and Richard Stallman. The presentation was given in English and simultaneously translated into Spanish. This two hour talk focused on the goals and techniques used by those customizing Debian. It introduced Debian and gave an overview of the universe of Debian customizers. It then broke down the idea of customizing into a number of logical pieces and, using the examples of UserLinux, Ubuntu, and Debian-NP or Skolelinux (the internal "CDD" groups), walked the audience through the nitty gritty of customization using in depth descriptions and code samples. The talk was given to the New York Linux User Group meeting in the IBM Building in New York City. I presented a talk at the New York GNU/Linux Beginners group Gnubies that covered Debian and Ubuntu. The month before the group had seen a talk by Sun. To provide a contrast with this talk and at the request of the group's leader, my talk aimed to introduce the principles behind Free Software first. After this, I described the way that Free Software philosophy is put into practice in Debian along with an overview of the project and distribution — its strengths and weaknesses. Finally, I introduced Ubuntu, a project that is both technically and philosophically inspired and linked to Debian and that, for a number of reasons, may be a good choice for many beginners. The talk was given at the IBM building in New York City. With Alan Toner and Jamie King, I represented Mute Magazine and help teach a 5 day course to a group of students — primarily artists — on issues of intellectual property and different methods of organized resistance to an expansionist model of IP. The published description of the session read, "With the increasing centrality of 'social labour' to capital economies, the popular notion of the Commons is drawn radically into question. What can be the status of 'free' resources in an economy which has brought the exploitation of unpaid co-operation and affect to its very core? Can 'free' really mean free 'as-in-libre'? Can a Commons also be contestational? And if so, how do we set about producing it? 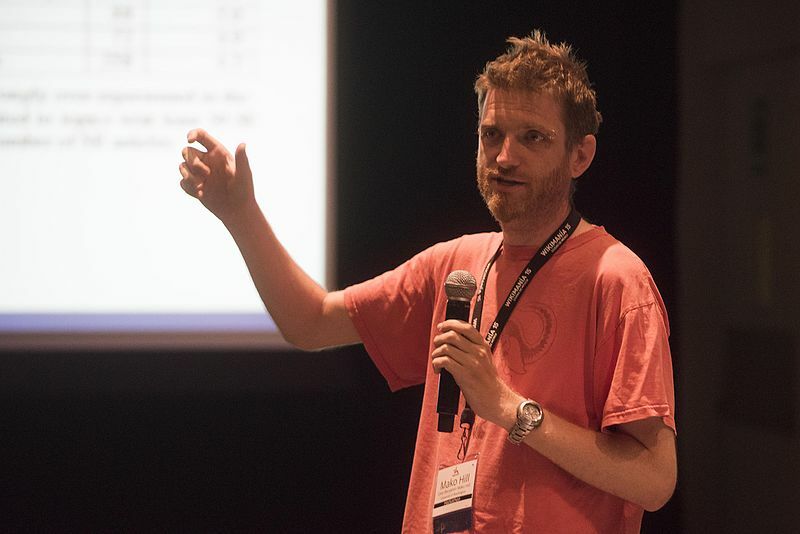 Jamie King (Mute, London), Alan Toner (Autonomedia, Rome) and Benjamin Mako Hill (Debian, Seattle) will host these five days of structured discussions, followed by a presentation during the main festival." Our session, part of the Werkleitz School of Common Property was held in Halle, Germany on August 27 - 31, 2004 preceding the Halle Biennale. Paying developers has been shown to carry unintended negative consequences. This talk explores problems and benefits of paying developers in volunteer projects and surveys strategies that projects like Debian have used to successfully finance development while maintaining their volunteer nature. The talk was given, with live translation into Spanish and Portuguese. After the success of last year's SPI workshop, the Debconf organizers invited me to give a second workshop on Software in the Public Interest, Inc. I gave a talk to the group to introduce SPI and then facilitated a discussion where people listed things that SPI has done well and things they would like to see it do, or do better, in the future. The results were submitted to the SPI board and membership. This talk, delivered jointly with Enrico Zini, represented the work of more than a dozen Debconf participants and several BOFs. I spoke last summarizing what was said before and laying out the methods for future collaboration and work on Custom Debian Distributions. At the end of Debconf, Debian-NP presented its project, and the progress that it had made during the week, to other Debian developers interested in Debian-NP. The talk was a basic introduction to Debian-NP. I gave the talk using the slides from Debian-NP: Free Software in Civil Society. 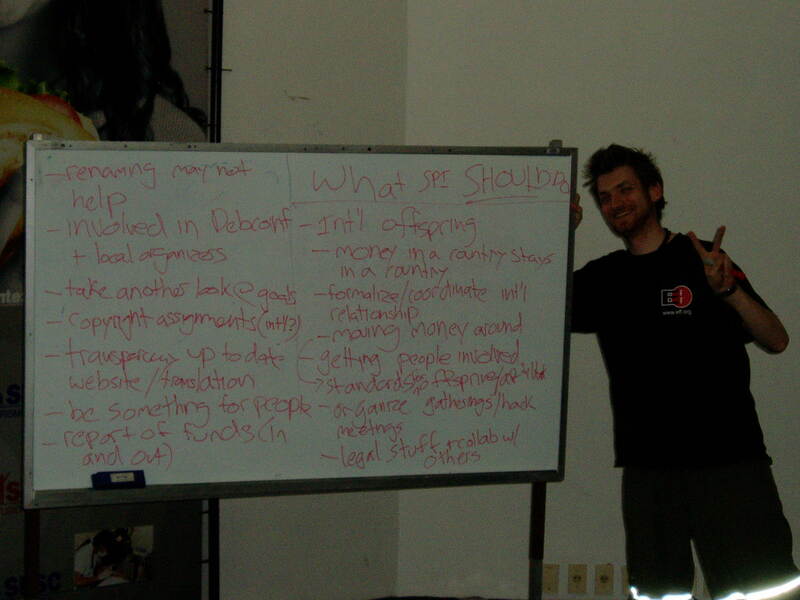 I helped plan, organize, facilitate, and participate in a Debian-NP mini-conference within Debconf. Dubbed “Debian-NP Bagunça,” a Brazilian Portuguese term for “mess” with positive connotations, the mini-conference provided a venue for planning, specification writing, and intensive development. This talk was another introduction to and description of Debian-NP. I reused the slides from Debian-NP: Free Software in Civil Society. The talk was translated live by Claudio Bantaloukas and featured and extensive discussion. This series of talks across Italy was organized by Hipatia, and FSF Europe and by local universities and organization in each of the locales. While each local event invited additional local speakers, the speakers that were flown in for the entire series included myself, Richard Stallman (FSF), Sergio Amadeu (Brazilian Government) and Diego Saravia (Argentina/Hipatia). While I spoke on a number of different issues, I served mostly in the capacity of a representative of the Debian project. This talk was a formal presentation of Debian-NP history, philosophy, goals, and a description of our success so far. It was given as part of Freedom Week. I engaged in session planning and group facilitation in addition to leading short meetings on public key encryption and Debian-NP at this one-day conference on Free and Open Source software in Nonprofit Organizations. The conference was organized by NOSI. The World Summit on the Information Society was a conference organized by the United Nations. In addition to attending the conference as a delegate of CPSR, I took part in the organization and execution of the counter/co-summit, WSIS? We Seize!, that was a gathering of free software developers, tactical and independent media activists, P2P advocates, and many others. This session asked: What are the major issues in the emerging information politics movement? While developing our understanding of the inequities of IP policy-making and law, should we also develop a strategy and attitude for dealing with it? Speakers included: myself, Christine Treguier (la FIL and Big Brother Awards France), Stefan Merten (Oekonux), Alan Toner (Autonomedia), Robin Gross (IP Justice). Working from Debian-Nonprofit as an example, I demonstrated how with only a list of Debian packages, developers could create their own customized bootable Linux distribution on a CD similar to Knoppix. During a joint presentation with Jamie Love who was presenting the film Dying for Drugs I gave an introduction to Debian-Nonprofit and Custom Debian Distributions and then facilitated a discussion. I passed out newly pressed Debian-NP CDs to all attendees. Delivered at an NTEN (the Nonprofit Technology Enterprise Network) conference, this talk introduced a panel on FOSS in the non-profit sector by defining the important terms in a discussion of free and open source software and by covering the basic advocacy points for non-profits. Linz's Radio FRO sponsored this two panel sub-conference of the Ars Electronica Festival 2003. I made a guest appearance on this panel (Panel B) to represent the position of Free and Open Software and to field questions. I facilitated the opening workshop at the 3rd annual Debian conference on the topic of Software in the Public Interest, Inc. The workshop included an introduction to SPI and discussion about where SPI has been and where it might go. This talks draws from and summarizes some of the research and writing that I've done recently with Biella Coleman. The Talk was delivered at the the 2003 Libre Software Meeting in Metz, France as part of the theme on extending Libre Software Beyond the IT Sphere. This talk was part introduction to Free/Open Source Software and part introduction to Free Software Business models. The was, in part, given on behalf of Sammondano and Partecs. This talk was given as part of the Division III Presentation schedule to parents and visitors on day before Hampshire College's 2003 Commencement. It lasted approximate 45 minutes.